Check out our services and discover how it can be engaging your experience at the beach. The collaboration between the two companies fielded by always devoted to the accommodation by the sea, was born Aquamarina Village, the first seaside village on the coast cervese created tout court. Since the merger of the spaces dedicated all’ombreggio implemented by the two companies, Bagno Dario e Bagno del Pino was born as an expanse of deck chairs, sun loungers and parasols that stretches for 210 feet of ocean frontage, able to offer its customers virtually endless possibilities on location choice for enjoying the sun and the sea on the Riviera. 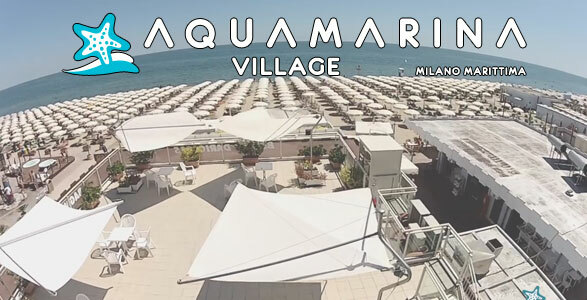 Located between the XV and XVII Traversa, in Milano Marittima north, Aquamarina Village, has added value to fit into one of the greenest areas of the resort, due to its proximity to the “urban pine forest” Ring del Pino and the natural pine forest in Milano Marittima which is pushed to the center of the “garden city”, allowing for a pedestrian and cycle link between the safe and attractive area in which is situated the village and avenues Gramsci and Matteotti, shopping centers, natural and life night of Milano Marittima. Aquamarina Village in 30 seconds! You can relax peacefully on the beach without having to have “a thousand eyes” to continually monitor their children! Children, for Aquamarina Village is impossible to get bored. Thanks to the large area dedicated to the playground.